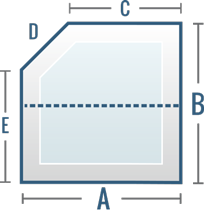 You have selected your spa shape as Square or Rectangle with One Cut Corner (Top Left). Now please input your measurements, choose your color and cover model to begin customizing your spa cover. If your spa has the cut corner on the right side instead, please use the One Cut Corner A shape.